In the production of our coffee liqueur we use a 100% Arabica Coffee that gives the right balance between aroma and strong italian expresso taste. The “Mr Exclusive”, the 100% Arabica of Lucaffè was the ideal ingredient to obtain Frida’s Coffeè. Due to the artisanal production method, any deposits, separations are normal by the nature of the ingredients used that are real and not chemical, we recommend shake it before serving and taste ice cold from freezer. 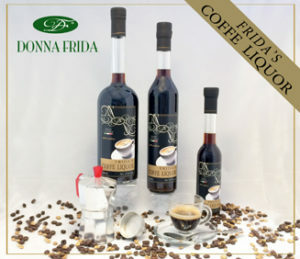 Frida’s Coffeè is “Gluten Free” as all the liqueurs we produce, it is a perfect Dessert liquor or on top of the ice-cream or if you like you can use for cake and particular dish.